Fancy slurping down cold, freshly shucked oysters for only S$1.99 at any time of the day? 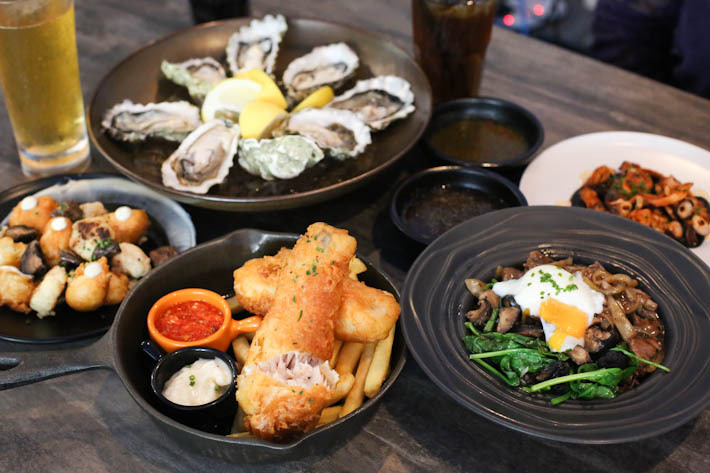 Yes, you can actually get a plate full of Canadian oysters without burning a hole in your pocket at this American bar in Clarke Quay—Oyster Co. Situated opposite popular Central Perk Cafe (and managed by the same team), Oyster Co is the first bar in Asia to serve Budweiser on tap. 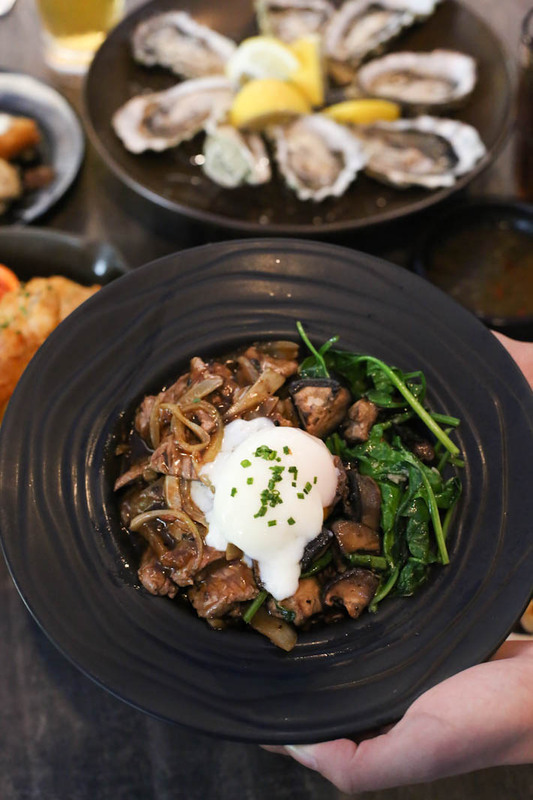 Drink to your heart’s content while you indulge in affordable S$10 Western set lunches and light bites. Being oyster lovers, we could hardly contain our excitement when the grade 3 Canadian oysters (S$1.99/piece) were served to us. Freshly shucked upon order, the moderately salty and robust flavours won our hearts. While we were given Canadian oysters, the owner also sources oysters from other regions such as Ireland and France as well. 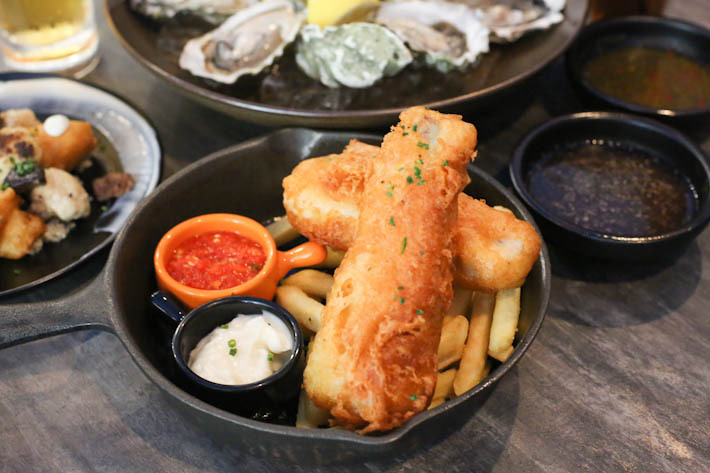 We recommend heading over during lunch time as Oyster Co has a decent menu featuring S$10 set lunches. The Fish & Chips (S$10++) came with batter-fried mackerel fish, Belgium straight cut fries and Hainanese Chilli. Deep-fried till golden brown, the crispy skin encased tender and moist fish meat which we enjoyed with the spicy chilli. We particularly liked how they chose to pair the dish with Asian chilli instead. Those who are health conscious may want to consider the Beef Bowl instead (S$10++). The moist brown rice was paired with runny sous vide egg, sauteed spinach and savoury mushrooms. This is a great dish for those who want to opt for something healthy that does not compromise on taste. Do not miss out on their tapas if you are there for a drink with your colleagues or friends. Prices range from S$8 to S$12. Some noteworthy finger food that we tried include the Cauliflower 3 Ways (S$10++) which allows you to enjoy roast, puree and tempura cauliflower with burnt butter quinoa and Squid Ink Paella (S$10++).